Allow me to introduce you to Yasmine Cheyenne. She is a mother, an Air Force veteran, and a Business & Project Management Expert. In this episode she shares with us about her humble beginnings in Brooklyn and how it taught her a whole lot about money. Let me tell you she does not hold back! I’d love to hear from you! What was your takeaway from this episode? Be sure to share your thoughts in the comments section below. [00:00:27] JH: Hey, hey, this is Jen. 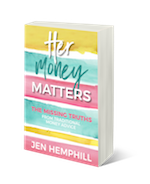 It is episode 25 of the Her Money Matters Podcast and we're literally, I mean literally one fourth of the way to the hundredth episode! I know it's silly cause it's still a bit away, but I just can't believe we're at episode 25, I mean it's hear toady. At the time that you're listening to this, when this episode really is released it's Thanksgiving. So first I want to say happy Thanksgiving to those of you celebrating in the United States and those celebrating — those United States citizens celebrating abroad as well, happy Thanksgiving. And today not only do I have a fabulous guest for you, but I have a fun gift for you as well and I feel it's timely for the holiday that I think you will enjoy. It's a kit that is all about being grateful for all things money. So I'm calling it my "Money Love Kit" and I'll tell you more about that later. But first let me go ahead and introduce to you Yasmine. Sp Yasmine Cheyenne is a business and project management expert who helps business owners and companies simplify and automate their business processes while managing their projects. So with over 10 years of experience of online business management, business operations, and project management and as well as being an United State Air Force veteran — go air force! Yes, Yasmine has a wealth of knowledge to share with her clients, which helps her quickly turn their problems and concerns into solutions. So some takeaways from the conversation with Yasmine, and you'll notice I'll say "Yasmeen", that's the Latina part of me coming out. And I try to stick to Yasmin, but I can't help that. So the takeaways, one of the takeaways is how cash is king, that perspective that she has and how it influenced her all the way into adulthood. Another takeaway was what her mother gave her tough love on, and what it has taught her about money. How often she checks her bank account and why, and lastly why her grandmother was her biggest influence and what it taught her about giving. So let's go ahead and talk to Yasmine, shall we? 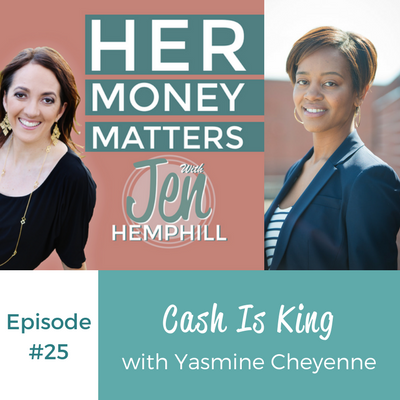 [00:03:09] JH: Welcome Yasmine to the Her Money Matters Podcast! I'm really excited and happy to have you here. [00:03:14] YC: Thank you! I'm so excited to be here with you. [00:03:16] JH: Well it's just been a treat, just getting to know you online. We don't know each other personally, but living so close together we definitely have to make an effort to get together. I know we've been trying to! But so it's just a treat, I've been getting to know you online and knowing that you're also an air force veteran, yay! I'm partial to that. So I'm excited to have you here. So you ready to dive in with the questions? [00:03:44] YC: Yes, I'm ready! [00:03:45] JH: Awesome. Now Yasmine — I want to say, "Yasmeen"! It's the Latina side in me. [00:03:52] YC: I know, I know! [00:03:52] JH: I'm going to get it right, I'm going to get it right! We know you're a successful entrepreneur and professional, but I want to know and I know our audience wants to know more about you, Yasmine the woman, the sister, the aunt, the mother. Just maybe something that you've never shared before that you're willing to share. Tell us a little bit about that side of you? [00:04:15] YC: Sure, that's a good question! So you know, I think probably the most interesting side of me that I don't talk about a lot is being a mom. My daughter is five, she'll be going to Kindergarten in two weeks. So you know that is just such a big ball of emotion. You know, sending your — and you know. [00:04:41] YC: Sending your little one to school, it's like you're so afraid of them growing up. It's such a precious but extremely difficult time, I think, for every mom. So you know that's something I've been doing in addition to everything else, you know, battling those emotions that my little girl's growing up. [00:05:05] JH: Yes, and not to — you know for me it hasn't gotten easier cause my oldest is going to be in 7th grade and every year I cry. First day of school, I mean it's just like clockwork I tell you. I'm always! Birthdays, first day of school, those type of things, with both of them. So it's just, time flies and it's so precious just seeing them grow up and become their own people and it's beautiful. [00:05:40] JH: Well thank you for sharing that. And then I want to know how you grew up around money. So tell us a little bit about that. [00:05:48] YC: Sure, so you know I'm from Brooklyn, New York. And New York is one of those places that it doesn't matter where from, or how much you make, or what demographic you're from, you need to be looking like you're going to a fashion show 24/7. It doesn't matter how much you make! So I grew up with the understanding that for my family, you know we were not very well off, but that with hard work you could do whatever you wanted to do. And I definitely grew up with the thought that cash is king. My family didn't believe in like credit and loans and things like that. My mom always used to talk about cash being king. So I always tried to, you know today it's a little bit more difficult because I have a debit card, I have all this stuff. I tried to take out cash and just have it in my hand to remember. [00:06:56] JH: Right, so cash is king. And tell us a little bit more the dynamics of that. So what kind of other things did your mom say, what kind of money conversations besides that, cause that's a great one, did she have with you? Or just in the household, what other things did you hear in regards to money? [00:07:13] YC: I definitely, like I said, we didn't — we were not very well off. So a lot of people that I grew up with, and even myself, most of my friends were middle class for the time, for the 90's. But I was not. I would consider myself lower-middle class or below in a single parent home. So I definitely grew up with the thought that, you know, money is precious and being extremely grateful. My mom was always very hard on me and my sister, and I still carry that with me today about being unappreciative and how important it is to be grateful for every singe dollar, cent that you have. So that's something I've definitely kept with me. [00:08:01] JH: Okay. That's beautiful. And tell me, I know you mentioned that in New York it's a fashion show 24/7, no matter what demographic you fit in. So tell me a little bit about that, cause you mentioned you were, I think you said the lower-middle class. So how did you fit into that and partake in that if you partook in that? [00:08:22] YC: Oh, it was so hard! [Laughter] It was so hard, you know, I just talked about my daughter going to school and thankfully I'm not in that demographic or I'm not in that class anymore. But, you know, she wears uniform. Growing up we didn't wear uniforms so I did partake in it. It's almost if you don't have a choice. You know we call tennis shoes sneakers, and so I kept my sneakers really clean. I think I cleaned them everyday! I washed my shoe laces, just little things like that so that they could stay cleaner and look newer longer. You know, my mom did her best to make sure that we had whatever fad thing was out at the time. But then from 14 years old, I worked. So I was a summer, working during summer school and when I turned 15 I had a part time job. So then I started buying my own stuff. [00:09:27] JH: Wow, okay. And then what would you say is the best money advice you received? I know you mentioned your mom said, "Cash is king," so I know that had a huge impact. But is there something, another advice that you received that you considered a good one? [00:09:43] YC: You know, recently in the past few years actually, since I've had my own business I'd say the best advice I've received was from a coach that I worked with. His name is Todd Herman and he is the founder of 90 day year. And one of the things that he always talks about is, you know, knowing kind of your worth and kind of getting out of your own head about money and making it a bigger thing than it is. So in terms of providing a service for someone comes with an attachment, obviously a cost, and you're charging for your time. So don't make the cost, don't lessen yourself by thinking that the service that you're giving isn't worth the price, if that makes sense? You know, a lot of people undercharge to be frank, a lot of people undercharge. It's because they don't feel that they're worth the price, or it sounds crazy to charge so much. [00:10:53] JH: ...than men. I mean that's definitely a huge trend that I see. Well that's some good advice! And are you the money manager in your home? [00:11:02] YC: I am, yes. [00:11:06] JH: So how do you manage it? Can you share a little bit about how you manage it? Maybe you have a system in place, or do you sit down once a month, twice a month? How do you manage your money? Can you give us a little scoop on that? [00:11:20] YC: Sure, so I do have a system in place. One of the main things that I do, I actually look at my accounts every single day. And although they don't change that often every single day, it's for me important to be 100% aware of money all the time so that I can be present with it. A lot of times you don't want to look at things and you just kind of want to ignore them and I think everyone goes through that phase. When you turn 18, you get your first credit card and you don't realize like, "Hey, you charge it all, you're going to have to pay that at some point." So you know, I thin my first credit card limit was like $200 or something, but at the time it was huge deal to me to have my first credit card, but learning quickly how fast your credit limit gets raised and all those kind of different things has made me more aware. When it comes to bills I think it's better to just auto-pay because I don't have time to go in and pay every bill. And honestly, the passwords today have just gotten so out of control. [00:12:30] JH: Oh yes! I so agree on that. [00:12:32] YC: I just don't have time. So I'm a big fan of auto-pay. [00:12:37] JH: Okay. Awesome, well thanks for sharing that. And what would you say is the best money you've spent? [00:12:46] YC: Yeah. As a business owner, I'd have to say the best money I've spent was on 90 Day Year. [00:12:54] YC: I didn't, it was — so any business course, to be more specific. Anything that I've done to invest in myself was the best money I've spent as an entrepreneur. Entrepreneurship aside, probably the best money that I've spent was, hmm, that's a difficult one. [00:13:19] JH: It could be something fun? [00:13:20] YC: Probably, yeah. Probably paying for my daughter to go, she had her birthday party at American Girl. That was pretty fun! [00:13:26] JH: Awh! I've heard so much. I'm a mother of all boys — like that many! It's two boys, but yes I've heard so much about American Girl. I think that parents either love it, or hate it. [00:13:40] YC: It is an interesting place, but she and her friends loved it so that was really awesome. [00:13:49] JH: Great, that's great! And what would you say is your best money memory? [00:13:54] YC: You know, honestly back when I first had my first part time job, I used to work at McDonalds. And back then I didn't have a checking account or a savings account, so I'd get an actual check, I'd go to the check cashing place to cash the check, have my cash, and that's how I'd spend my money. Those were some of the most, my best money memories, the first time that I was able to work for my own money, receive my own money, actually receive it and budget it. And at that time, obviously budgeting was buying the things that I wanted. You know, I didn't have any bills or anything like that. That kind of instilled that work ethic and that money awareness early for me. [00:14:45] JH: That's beautiful. I know for me it's been that too. Buying my first car, cause I know I grew up in a household that didn't buy a car for me, you had to do that yourself. You gotta get to work, and so for me just being able to do that was, I mean it's something I'll never forget. I mean I did it myself and you know you take pride in that. Then of course it was the mission of like, "Okay, I gotta pay this loan off as fast as I can!" And so that's great. And I know you mentioned cash is king, so what is your favorite way of paying, cash, check or credit? [00:15:24] YC: You know honestly I do debit the best. Since being in the military and all of that, it's just check, I don't like the fact that it takes so long to go through. It's always a nerve wracking thing for me, so I just prefer to just pay debit or credit. But every now and then I do like to take out cash and just pay cash. So yeah! [00:15:53] JH: Awesome! And what would you say, it kind of goes along with the best money memory, but your proudest money moment? [00:16:01] YC: Yeah, you know when I deployed I got a huge sum. You get more money when you're deployed. That's probably my biggest moment. I don't think I had ever seen that much money up until that point. So the way that I chose to spend it and use it was probably my proudest. I bought a car. It was a cool car at the time. [00:16:31] JH: That's great! Cause I know, especially I've seen in the military young airmen deploying for the first time, getting that chunk of money and maybe not having a plan. So all of a sudden that money's gone. So not good but that's good what you did with it. And who would you say influenced you the most in the area of money? [00:16:56] YC: You know honestly probably my grandmother. [00:16:59] JH: Okay. Tell us about that. [00:17:28] JH: The mattresses, and all that. [00:17:29] YC: ...the mattresses. I just think it's one of the coolest things to see all of the different areas that money is pretty much stashed away in the house. But she was very much a person of, "it's okay to splurge sometimes". You know, she wasn't well off or rich or anything, but it's okay to splurge sometimes but it's also more important to give. I think my grandmother would give, I mean people would come to our house to get meals and get canned food and stuff like that. To see someone be able to give when they don't really have a lot. [00:18:05] JH: Yes, those big-hearted people. [00:18:06] YC: Yeah. So she's definitely probably the most influential for me. [00:18:10] JH: That's beautiful. It's seeing people like that really touches my heart, especially seeing — we have some family members like that. They don't have much, but they are willing to do anything and you know no matter what! And it just humbles you for sure. So that's beautiful. And Yasmine — I got it right! I wanted to say "Yasmeen", but you know this podcast is all about making money simple, and taking control of it. So how would you finish this sentence; her money matters because ______. [00:18:51] YC: Because it's yours. [00:18:56] YC: You know I think the biggest thing people do is, to complicate money, is they think about how it's going to be lost before it's even gone. And creating a budget and spending within your means and trying to stay as down to earth, for lack of a better term, as possible I think is the simplest way to manage money. You'd be surprised how much more money you have when you keep it like super simple. [00:19:27] JH: Absolutely. I like that. Well thank you so much for being here Yasmine. [00:19:31] JH: Tell us where is the best place for people to find you and learn more about you? [00:19:37] YC: Sure. Definitely my website, it's YasmineCheyenne.com. It has all of the information to contact me and learn more about me. [00:19:47] JH: Beautiful. And I'll just make sure to be sure to include that in the show notes. So thanks again Yasmine for being here. It's been a treat and getting to know you more. And we'll talk again soon! [00:20:02] JH: It is always so interesting just chatting with the different women that I have the opportunity to interview, and just learning from there where we all have different stories, different backgrounds, different insights that if we bring this money talk, if we start conversing about money not being afraid and just throwing that taboo to the curb and really starting the conversation about money, not being so afraid, that we can help each other so much. I know that I have learned and gotten to gain so much insight from my guests and with today's chat with Yasmeen, or Yasmine! It was no different. So thank you Yasmine for all the insight, your stories, and I really love that story about her grandmother and just her grandmother's giving spirit, just so beautiful. So just be sure to look at the show notes, I'll share with you later how to access those and that way you can connect with Yasmine if you like to learn more about her. But I wanted to give a quick shoutout to Julie in Germany. She recently attended one of my live classes where I shared what I call the Virtual Money Method. And it's just a different way of managing money and something that I've adapted and tweaked over the years that has really made a huge difference and impact on how we manage our finances and just really, really has simplified things. So in class she had mentioned some of the feedback was that, "I love that the system involves real money. When I look at my Excel I am a millionaire, but somehow the money gets always lots on my accounts." And I know that too well, and I'm sure other people know that as well. So I'm glad Julie that you enjoyed the class and that you come back for another one. So if you are not aware of my online classes or webinars, if you want to call them that, I hold them — I don't have a set schedule yet, because my schedule has been just so variable. But I do hold them occasionally. So what you can do if you want to be notified, I'll share with you, it'll be in the show notes where the link — there'll be a link there where you can opt-in and I will be sharing with you when the next class is. So you'll get notified immediately. Now today's episode was amazing, so again Yasmine, thank you so much for that. And let me tell you about what I want to give away today for you, my gift to you. So I called it "The Money Love Kit", and it's just really a kit to help you have more gratitude and around money, all things money. So yes, I'm giving it to you at Thanksgiving and I'm calling it a Money Love Kit. I don't know, but really in essence, when you express gratitude and thanksgiving with your family, you're expressing love. So there you go, that's how I'm going to tie it in and I'm going to leave it at that. So in this kit, basically it's just a downloadable PDF, it'll tell you exactly what you need to do. It's just a fun thing to do, and really all you need is a PDF and a jar, and a glass jar. And that's it! You download the PDF, you follow the instructions, I have little cards for you that you can cut out and you're going to be expressing "your love for money". And I'll show you exactly how you're going to do that and it'll be fun. So if you are interesting in taking advantage of the opportunity to get your Money Love Kit, all you need to do is text the word "moneylove" to 33444. So again, text the word "moneylove" to 33444. And I'd love to hear your feedback on that cause I decided to put it together, I thought it would be fun, but definitely give me your feedback. I haven't shared this with anybody, I'm giving it to you, and of course I will highly value your feedback. And for those of you outside of the US, my international listeners you can also go to today's show notes. 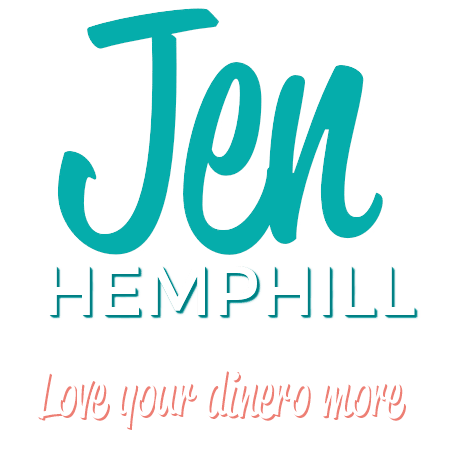 So today's show notes is at www.JenHemphill.com/25. So thanks again for listening. That is a wrap for today. I want to thank Yasmine — I think for the third time, but hey you never can be too grateful, right? — for joining us, for sharing her insights, her story. And go ahead and go to the show notes, today's show notes, to check out the different links, different things that we talked about at JenHemphill.com/25. And I will talk to you again next Thursday. Enjoy your family, enjoy that Thanksgiving for those of your celebrating it. And for the others, I'll definitely see you next Thursday. Take care.